Do not ignore this letter! The first of these steps is to register your holdings at the share registry. What is a share registry? Some people are confused by exactly what a share registry is and what it is used for. To make it clear I will give an example using something that people are more familiar with – buying a car! When you buy a car you buy it from a marketplace. Now the marketplace where you buy the car may be the BMW dealership, it might be Car City, or you might buy from Shane off Gumtree. Once you own the car the place that you bought it from has no further interest in you. The marketplace’s role in your purchase of the car is finished. But your personal responsibilities regarding the car are not. What do you have to do after buying a car? You need to register it. The places where you can register your car differ by state. Your car registration is held with VicRoads if you live in Victoria, or the Department of Transport & Main Roads if you live in QLD etc. Wherever you live, these departments play the role of the Car Registry for that particular state. Your address and contact details are registered with the car registry. And this is how the coppers know where to send you fines when you are caught doing 53km/h in a 50 zone. Your details are not registered with the place where you bought the car. The marketplace has no interest in you once the car has been sold. The process is the same when buying shares, you need to register your share holdings with a share registry. When you buy shares, you also buy them through a marketplcae. With shares the marketplace where transactions take place is called a broker. Examples of brokers are Commsec or NABTrade. After you have bought shares you need to register your ownership of these shares at the share registry, just as you would register your car at the car registry. The share registry is the place that holds your address and contact details. 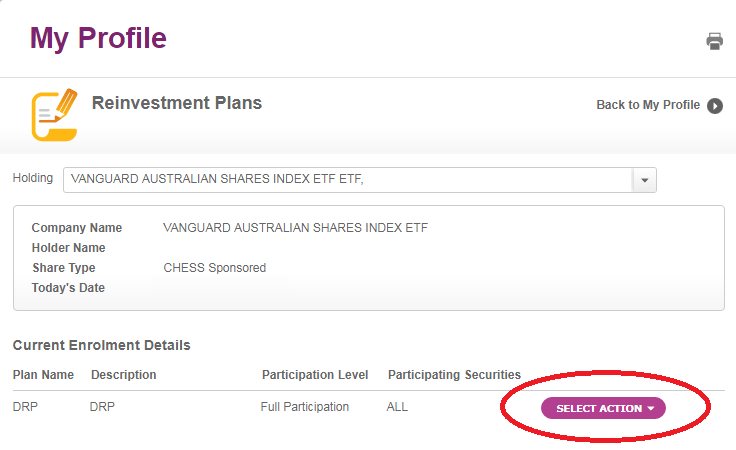 This is how the company or ETF that you own shares in knows how to communicate with you. Now on to how to register your shares with a share registry. 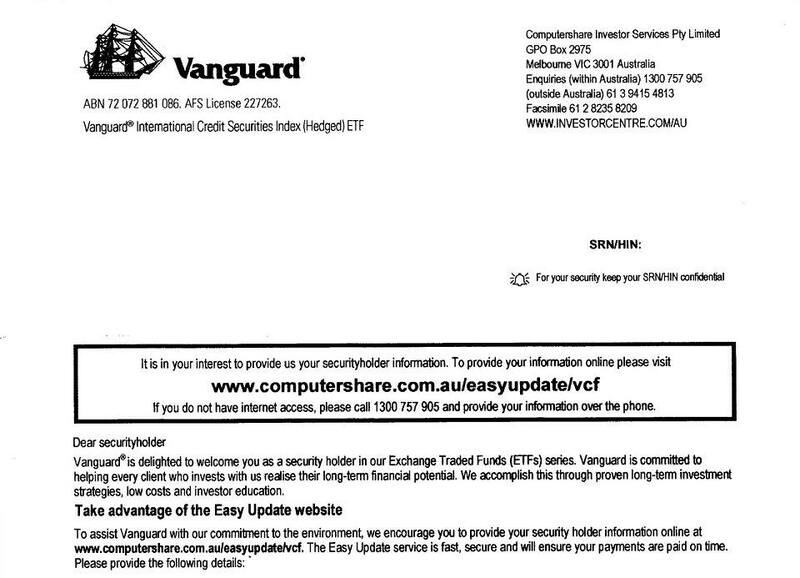 For all you Vanguard buyers, Vanguard has opted to use Computershare as their share registry. If you aren’t sure which registry the company you own is using, just wait until you receive the welcome letter. This will tell you which share registry to use. After you have purchased your ETF go ahead and follow the instructions in your welcome letter to register an account with the relevant share registry. This is where you give the details of the bank account where you want any dividends you receive to be deposited. 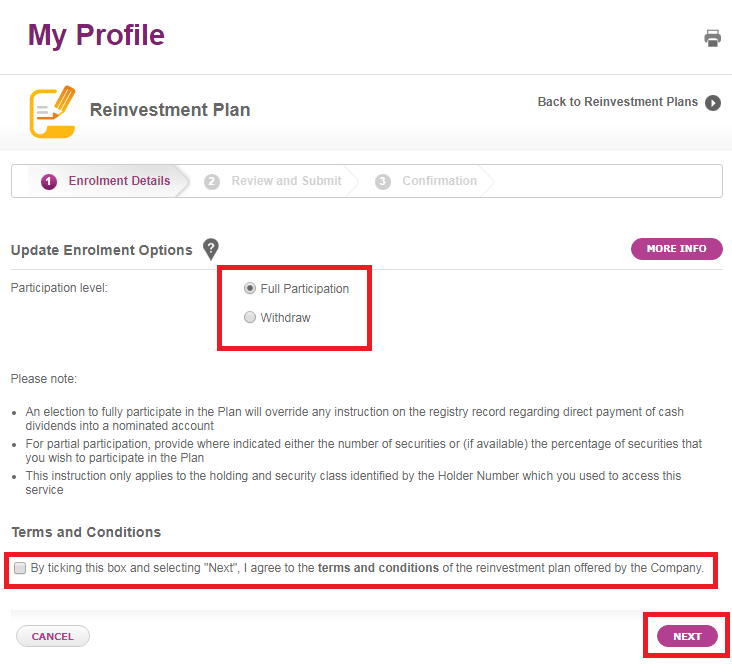 If you don’t want to receive your dividends in your bank account and would prefer to participate in the dividend reinvestment plan, this preference is communicated after you have registered. Here you let the share registry know your email address so that you can receive company communications electronically. Alternatively you can choose to receive this information at your mailing address. If you are an Australian Resident it is in your interest to provide your TFN. This is so that the correct withholding tax is applied based on your residency status. Ok now you are registered with the share registry lets look at how to enroll in the dividend reinvestment plan. In this example I will walk through registering for a DRP on Computershare. The option to register isn’t as obvious as you might think it would be so I will use a few screenshots to show you the way. 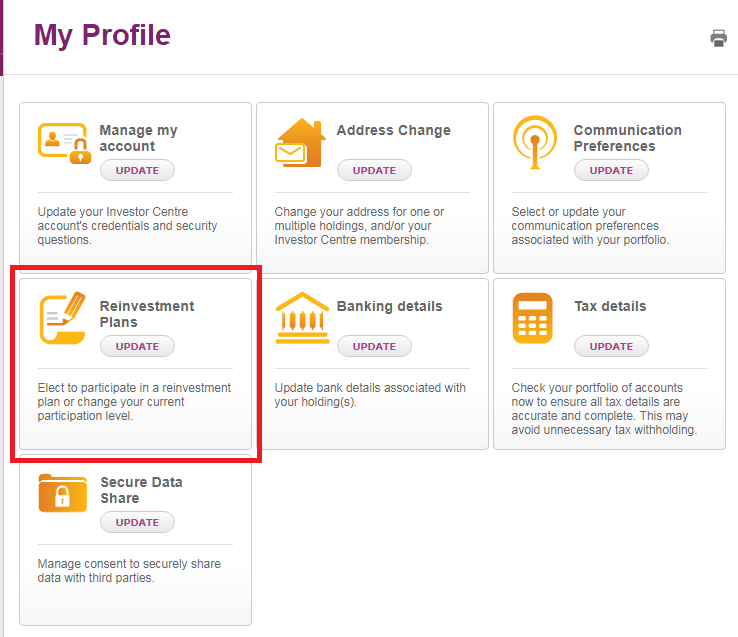 After clicking next a couple of times you are now enrolled in the dividend reinvestment plan! You may receive a letter in the mail confirming your change in reinvestment plan option. Now the next time that your ETF shares issue a dividend, rather than paying out a cash dividend the company will buy more shares for you at no cost!